The latest from the worldbeyblade.org team on tournaments, contests and breaking Beyblade news. HMS & Plastics Remembrance Day 2016 + BeyLotto + Face Contest + More!! We've got some great announcements for you now, so sit back and enjoy! HMS & Plastics Remembrance Day is especially relevant this month, so let's all celebrate this July 23rd & 24th!! It's not fantasy, this is for real: Bakuten Shoot Beyblade, the first generation of Beyblades released back in 1999, is making a (small) comeback! 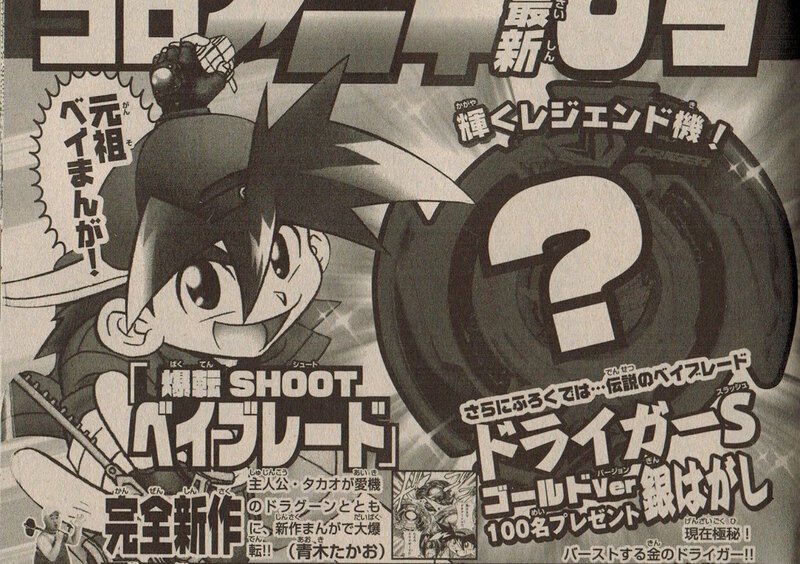 New Bakuten Shoot Beyblade manga chapter getting released in a side CoroCoro magazine, drawn by the original author Aoki Takao and featuring the four original main characters Takao (Tyson), Kai, Max and Rei (Ray). This manga chapter will be scanlated by a team of your fellow WBO Members and posted ASAP after publication! A gold Driger S Burst Ver. will be given away in a limited lottery in that CoroCoro issue. A Bakuten Shoot Beyblade 1 Legendary Beyblade book will be released on July 15th 2016 in Japan. 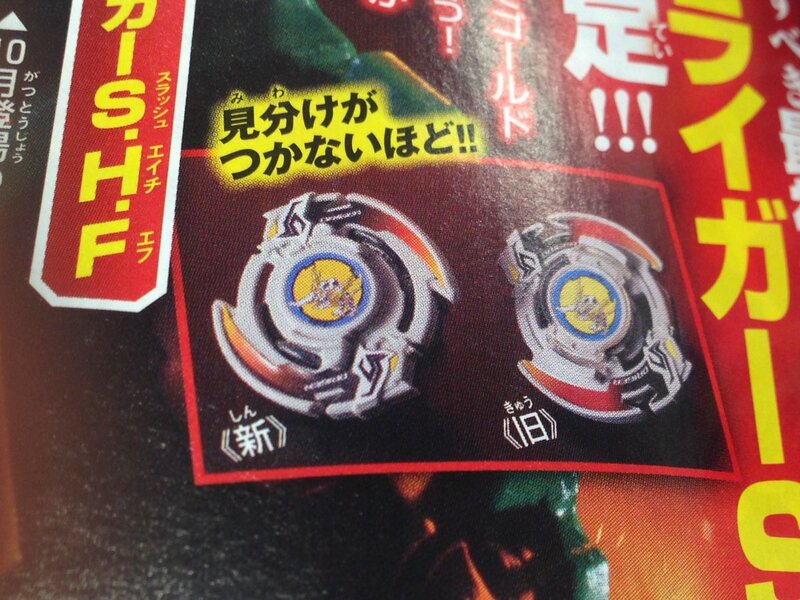 Around fall, Dranzer S, Draciel S and Driger S are confirmed to be reproduced as Burst Beyblades. But the excitement doesn't stop there, oh no! We're only getting started!! Tournaments of the HMS or Plastic format! No celebration would be complete without our members and their communities across the globe coming together to play Beyblade and pay homage the series that started it all. What's more, all participants of an HMS & Plastics Remembrance Day tournament will receive 1 extra Credit just for the occasion! That means you can get two Credits just for entering the tournament, which gets you at least one Face Booster or more in the Blader Rewards campaign! More events will be added as they are confirmed, so send us those proposals! If any more incentive was needed, a BeyLotto ought to suffice! This time around, all 10 winners picked will receive their choice of the Plastic-themed Face Boosters we rarely get to see! That means that you've got even more chances of obtaining one, on top of those you can get for participating in an HMS-format or Plastic-format tournament all year long! As usual, the top prizes are reserved for Passport Holders as thanks for their continued support! towards the purchase of any Plastics or HMS items! With the classic main S-Series Beyblades getting re-designs for Burst, we're challenging you to step into Takara-Tomy's design team's shoes once again! This time, to reimagine and redesign old school Beyblades as members of the Burst System! That's right, winners. The top three entries will each receive a Face Booster! The S-Series Beyblade Burst of their choice! 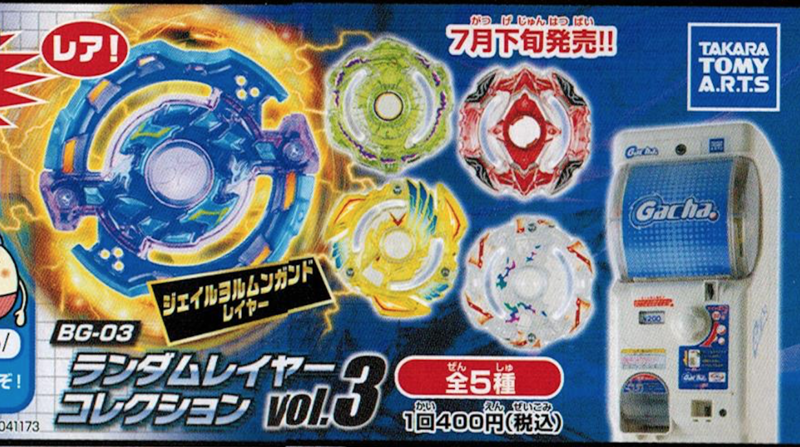 Considering Takara-Tomy is already remaking the S-Series, we ask that you steer clear of redesigning those Blades and focus your attention to the rest of the incredibly diverse Bakuten Shoot Beyblade and HMS lines. You have until July 31st 2016, at 11:59:59 PM EST to submit your entry! Plastics and regular Face Boosters still not enough for you? Well, you can get HMS Face Boosters for contributing to the WBO in a very special way: by donating $10! 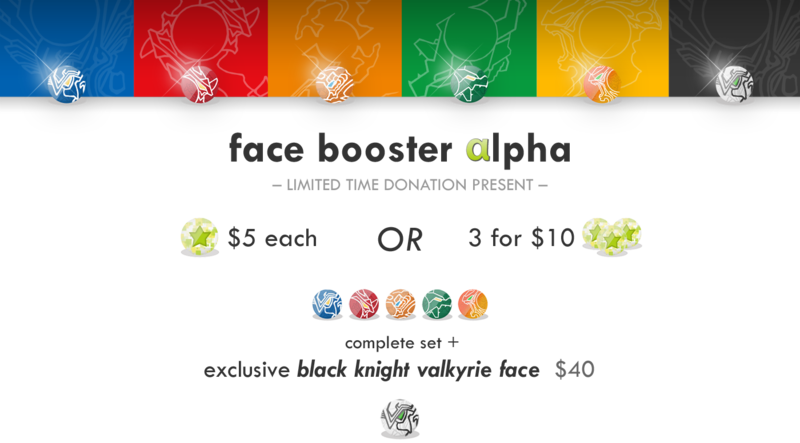 When you make a donation of at least $10, you can choose between Face Booster BLACK II, WHITE, or WHITE II! Donations can be made via Paypal online, or directly at tournaments simply by giving an extra amount to the host, who will then transfer the total amount to us. Where would the WBO be without its ever elongating list of avatars to choose from in its Default Gallery? In line with tradition, HMS & Plastics Remembrance Day brings with it a slurry of nostalgia blended with the present — like this year's new additions to the avatar gallery! Plastics & HMS on Social Media too! Lastly, keep an eye on the WBO's social media pages over the next few weeks for plenty of Plastics & HMS related content! Do that and tag us @worldbeyblade to get 1 extra entry in the BeyLotto! We're really curious to see what you're going to post, so if you do the sharing, we'll do the caring! Happy HMS & Plastics Remembrance Day!! Hasbro's Beyblade Burst app to launch this August! We've got a few small announcements piling up, so we'll begin with the much awaited BeyLotto and #BeySelfie winners, and then you'll see a couple of Organized Play-related news. They're mostly things that we already discussed or mentioned in the past, but we are officializing them properly. We had some amazing entries this year, it was awesome seeing all the different styles but, most of all, the pride you guys had in taking a Beyblade-related photograph with yourself in it! You can claim your prize by sending Bey Brad a private message! Nice job on those quetz-reinforced glasses! Amazing job, you guys! 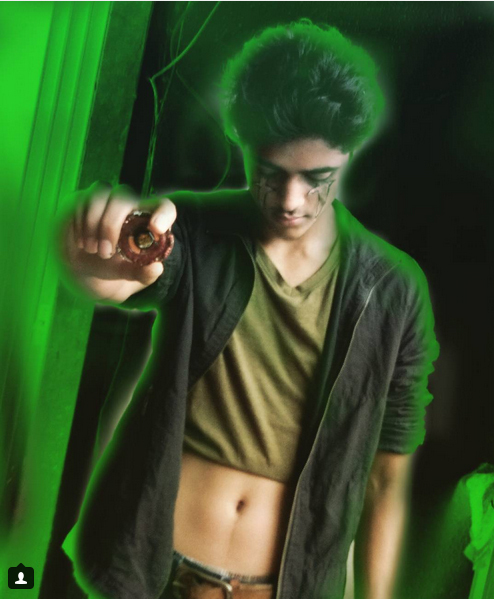 Even if you used a program to add effects, you made the effort of cosplaying and making your picture litterally come to life. To reward you for taking this challenge a step further, we'd like you to give you a Face Booster of your choice, out of those listed right below! Simply post your selection right in this thread! This year's BeyDays BeyLotto had a total of 116 unique entrants! And there were 9 tournaments in 8 different regions. This is huge! Thank you all for participating so much! Right now, who would even believe that Beyblade is inactive worldwide? To top it all off, we have some great prizes to give you, so let's get the ball rolling! Nice! And we've already got people from different areas! Congrats to you guys! Bravo! We bet you never expected a few tournaments and a one-month-old account to make you win so much, right? Congratulations on the win, maybe luck's got you on its side thanks to your multiple analyses! Wow, you litterally couldn't have asked for more! What are you going to choose? Congrats! All winners of a physical prize should send a PM to Kei with your full name, shipping address, and phone number. Everyone mentioned here should also post their Face Booster selection in this thread, and we'll get to distributing them as soon as possible once a few of them have accumulated! Congratulations to all the winners, once again! BeyDays was a blast thanks to all of you. What did you all like about this year's BeyDays? What would you change? Over the past eight years, many hundreds of tournaments have been hosted, and without much trouble at that. Since we are all just fans dedicating an insane amount of time to this hobby, of course we accomodate and make modifications along the way to make things better for the community overall. With the bright future of Beyblade Burst's globalization right on the horizon in mind, we wish to formally announce some rules that have been implicit so far, and also introduce a change that will probably please quite a few Bladers! Remember how we announced a few months ago that the Blader Passport would now cost $15 US? In retrospective, we've decided to take into consideration that some countries' economies were too low and that this increase of value was actually detrimental and tournaments were less likely to take place there due to the new price. We have therefore decided to modulate the cost of the Blader Passport for our longterm Indian community: for you guys, it'll be only $10 US, effective immediately! We hope that you guys continue to show your Beyblade Spirit in tournaments for many years to come still! If there are ever areas with a similar economical situation, we will of course consider giving them the same priviledge. There are some occurences we have tolerated in the past without complaining too much, but as we keep growing, we have to step in when we're expected to make things fair for everyone globally. Unfortunately, sometimes that translates in some moderating moves like the following. A maximum of two events can be held per day. Only special occasions or instances where something will definitely stop a region from holding more events in the subsequent months will justify organising more tournaments in one day. This is essentially a sister rule to the 8-Credit limit per weekend anyway, which some ran into when playing in more than two tournaments per weekend already! 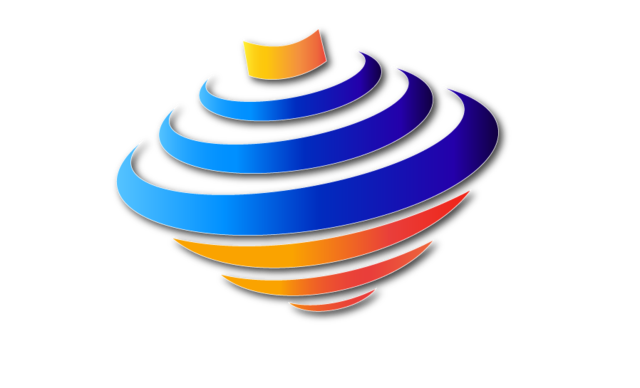 Entry fees for side events cannot be collected at WBO sanctioned tournaments. While we appreciate the efforts of organizers who want to do something special, because we cannot oversee these events nor ensure that attendees understand they are completely separate from the WBO, we have to ask that organizers refrain from hosting side-events that charge fees separate from the usual WBO tournament fees. We encourage organizers who want to do something extra at their events to work with us. While we've always been applying reimbursement for prizes equally or proportionally to all regions and instances, it's something we never actually wrote down and announced, so here you go! Exceptions are made for major events (e.g. conventions). Reimbursement amounts are per day, not per tournament. Small variations may be allowed, and of course a lesser amount can be asked as reimbursement, but you should expect this sort of ranges globally. It also helps if you collect more single entry fees and, in other words, attract new Bladers to your tournaments! That's it for now, but stay tuned for a lot more news coming up soon! 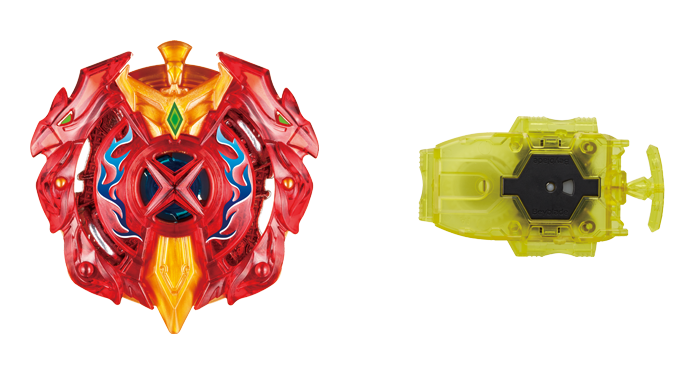 Dranzer Spiral, Driger Slash and Draciel Shield are now confirmed to be released as Burst Beyblades by Takara-Tomy, in late 2016! 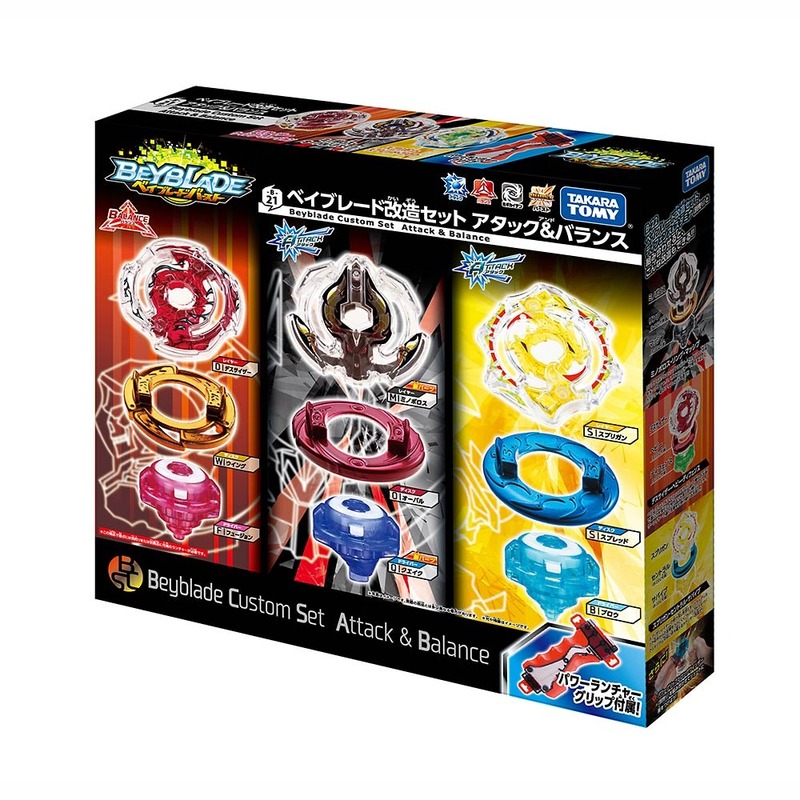 October 2016 - Driger S.H.F (Heavy Fusion) will be one of the eight Beyblades that you can get in the Random Booster Vol. 4, for 972 yen. November 2016 - Dranzer S.S.T (Spread Trans) will be available as an exclusive wbba. store item in Japan, for the cost of 972 yen. November 2016 - Dragoon S.W.X (Wing Xtreme) - A CoroCoro Aniki Exclusive Recolour Ver. will be offered as a mail order item in the 11/15 CoroCoro Aniki issue meant for an older audience than the regular CoroCoro magazine. December 2016 - Draciel S.C.P (Central Press) will be included in the Random Booster Vol. 5, for 972 yen. It is unknown so far how the regular Dragoon S.W.X will be released. TAKARA-TOMY has been extremely aware of the recent resurgence of activity from Bakuten Shoot Beyblade fans, from videos uploaded to YouTube to an increase in the number of tweets and online messages posted about that first generation of Beyblade. This is also why they made the conscious decision to open tournaments for all ages in Japan since the beginning of Beyblade Burst! On July 2nd 2016, TAKARA-TOMY also opened a call for 100 people ages 16 and above to participate in a promotional video related to Beyblade Burst, most likely concerning this throwback to legendary Beyblades whose audience has now aged above the target audience for Beyblade Burst. The method in which they will be made available is still entirely unknown. 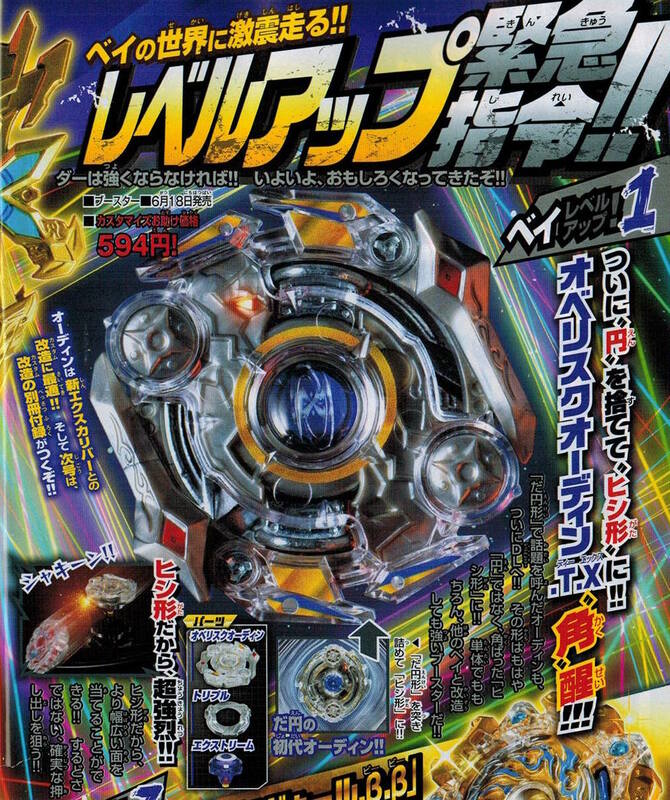 However, the source in which this news was discovered usually indicates a regular release, so we can expect that they will at least be more widespread and available than the mere 100 gold Driger S Burst Ver. we were only known to get until today! 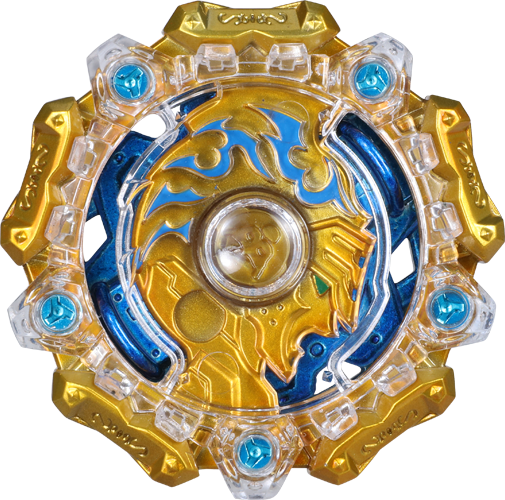 No word on Dragoon Storm yet, but it would be completely odd if it was not remade and it was only the other main Beyblades that would come out. There might be an Ultra-Reshuffle/Custom Set being released too, but that could be for regular Beyblade Burst products and not this special Bakuten Shoot Beyblade re-release. 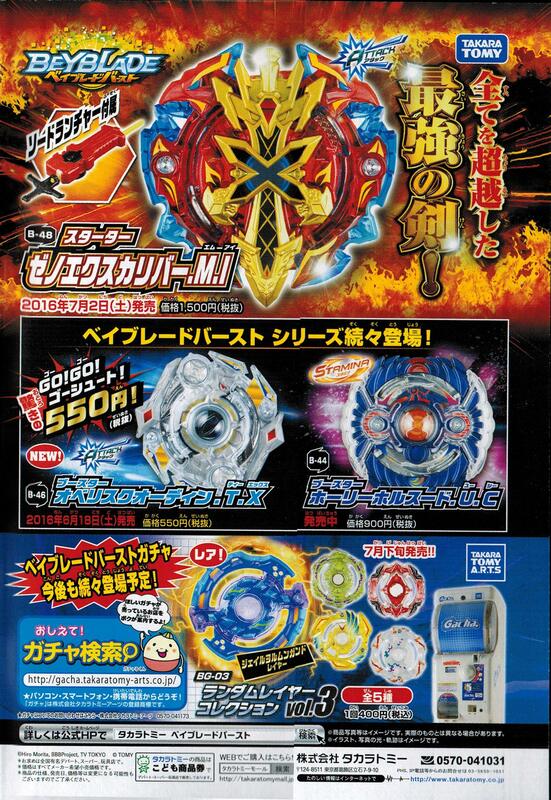 Alternatively, it could be the set in which Dragoon S Burst Ver. gets released. We'll continue to follow this exciting news closely and post updates as they come. 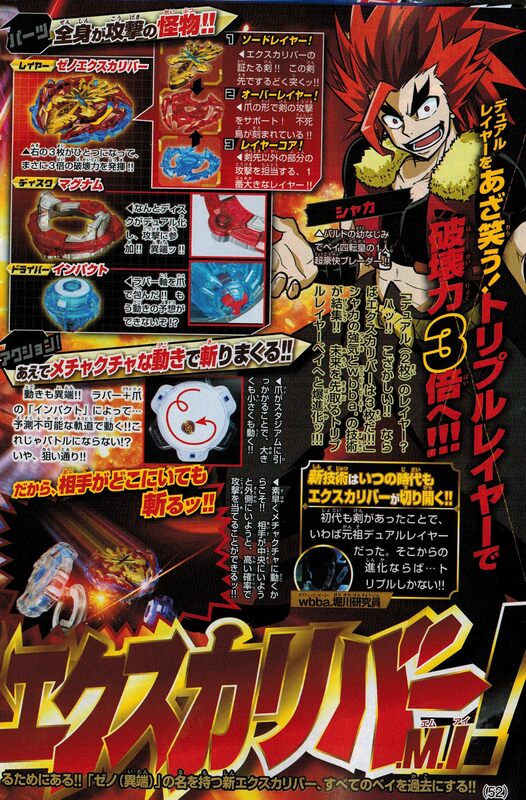 There’s been a ton of breaking Beyblade Burst news over the past few days, and now that we got our hands on this month’s CoroCoro — the monthly Japanese magazine that features Beyblade in it every month — so we thought it’d be helpful post a summary of everything. Warning: big images ahead, as these are full-sized magazine scans. As was previously known, Xeno Xcalibur is the first Layer to have a three-layer construction. 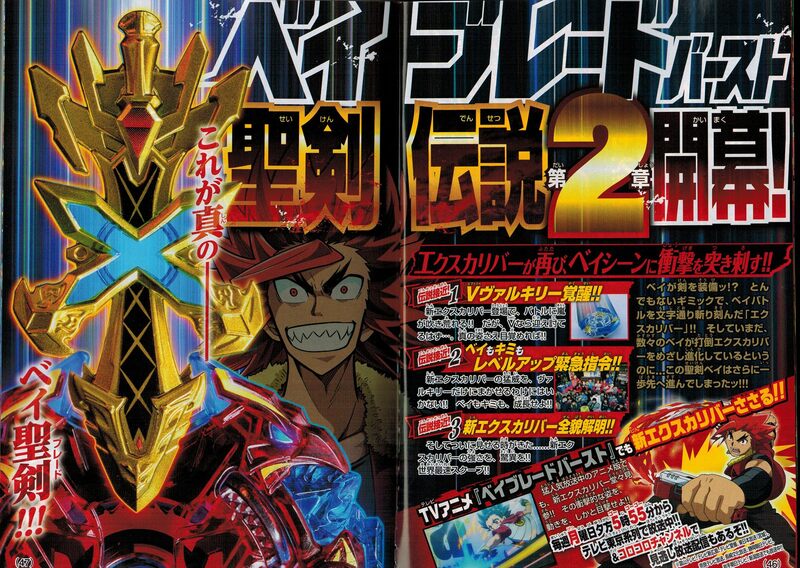 A large golden sword, a clear red middle piece, and an icy-blue base that features several aggressive-looking spikes projecting outwards. [*]A new disk, Magnum, which is the first Disk to also feature an attached plastic layer. It’s impossible to guess how it will perform, but it seems clear that the idea is that the Disk can be used as a method of attack as well as the Layer. 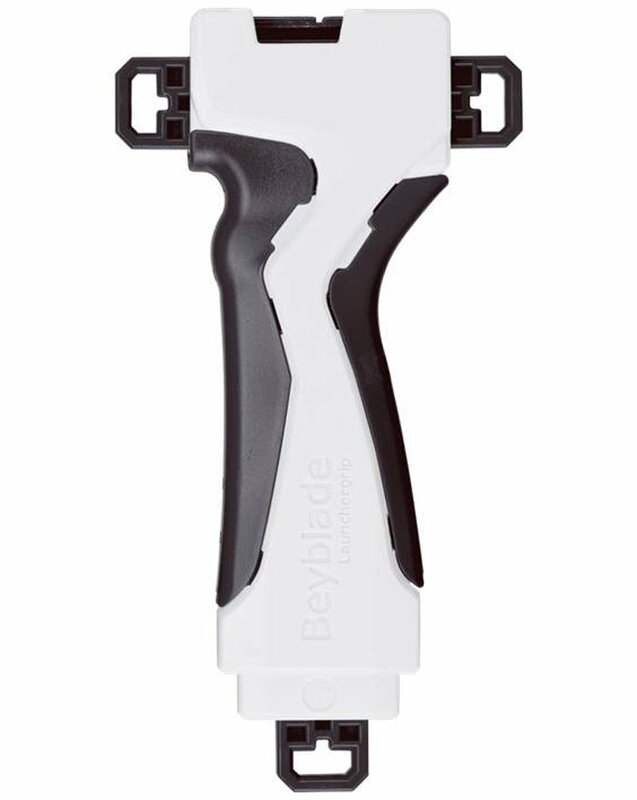 [*]Finally, the new Impact Driver features a Y-shaped rubber tip dissected by plastic. The image in CoroCoro depicts an unusual movement pattern, but of course, it’s impossible to draw any conclusions about its real-world performance before we get our hands on it. We also finally have some more information on the mysterious Sword Launcher and Sword Winder that come with Xeno Xcalibur. It appears to be similar in design to the winder-based Light Launcher, with a built in grip that the winder passes through. Evidently, rotating the Sword Winder will allow you to switch between “Power Mode” and “Control Mode.” We don’t currently know how each of these modes will function. Xeno Xcalibur .M.I will be released early at the World Hobby Fair, with a general release on July 2nd. Also coming in early July is Random Layer Booster 3, featuring the prize Layer Jeir Jormungand, a green Evileye, red Yggdrasil, yellow Victory Valkyrie, and white Kaiser Kerberus. These are obtained in ¥400 vending machines in Japan, but some retailers do sell complete sets. It will be available as the Rare Bey Get Battle prize on June 25th. This month’s release is Obelisk Odin .T.X. which releases on June 18th. Since Obelisk Odin was the prize of Random Layer Collection Vol. 2, it’s not a new part — nor is Xtreme, which debuted with Xcalibur Force Xtreme last December. The only new part is Triple, a round disk with three projections. 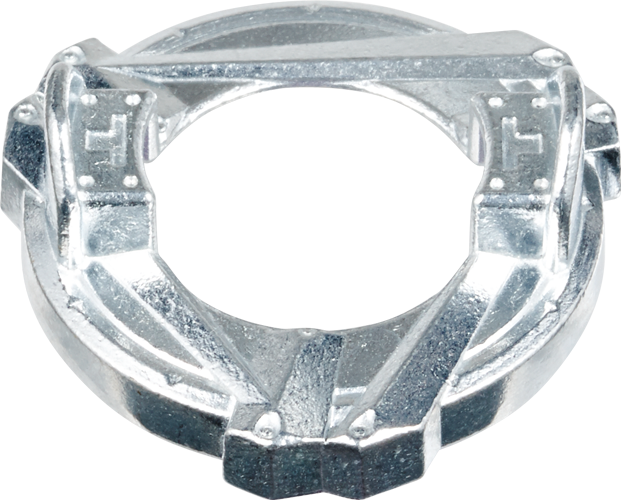 However, this is the cheapest way to get Xtreme, a top-tier part that wears down over time. It’s also the cheapest Burst booster ever, being sold at a special promotional price of just ¥550 (compared to the regular price of ¥900). Finally, we come to what’s perhaps the most shocking news of the month. 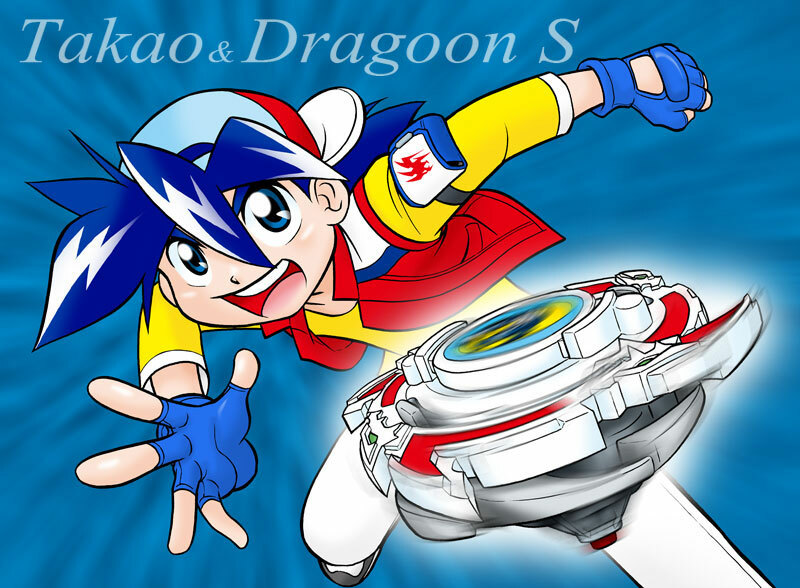 We’ve known for a while that a new chapter of the original Bakuten Shoot Beyblade manga — featuring old characters like Takao (Tyson) and Rei — but it was revealed this month that there will also be 100 Driger S Burst Beyblades produced, advertised with a darkened photo of what is unmistakably the original Driger S design remade as a Burst Beyblade. 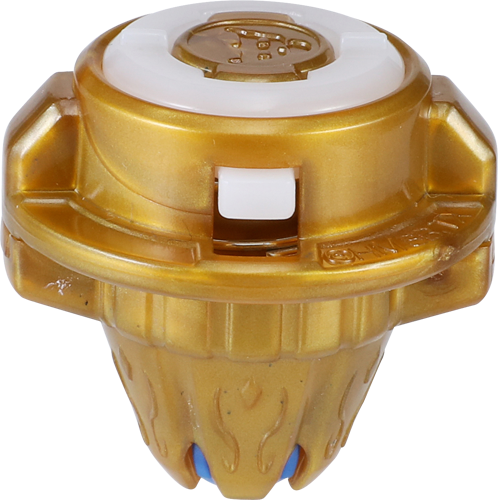 Unfortunately, only 100 of these gold Driger S Burst Beyblades will be produced and given away as lottery prizes. It’s unknown whether it will ever be made more widely available. But we can all hope. Big thanks to @[Kai-V] for the scans. Rise and shine World Bladers, it's that time of the year! We got you doing a double-take already, right? That's correct, we're starting off with a surprise right off the bat: this year, BeyDays officially extends and spans over two weekends! Since we know that life doesn't allow everyone to be able to participate either on May 28th or 29th for various reasons (not to mention that our Anime North events monopolize the greatest Bladers and hosts in the North America East Coast each year), you will now have a second official weekend to be able to take part in this celebration of Beyblade and our Beyblading spirit! To be fair with every region, each area can only organize BeyDays tournaments during one of the two weekends. Actually, nobody's stopping you from hosting events on all weekends, but for what follows just below, any exceeding tournaments won't be considered as being part of BeyDays festivities, unfortunately! Without further ado, here is the plethora of events currently confirmed to take place around the world for BeyDays! Participants of any WBO tournament that takes place during BeyDays will receive the Face of Days VII! Check out if you live close to a tournament and post in the event topic to confirm your presence! Don't skip this opportunity, BeyDays tournaments are always the most memorable! As usual, all BeyDays events are exempt from the limit of Credits of 8 per weekend. 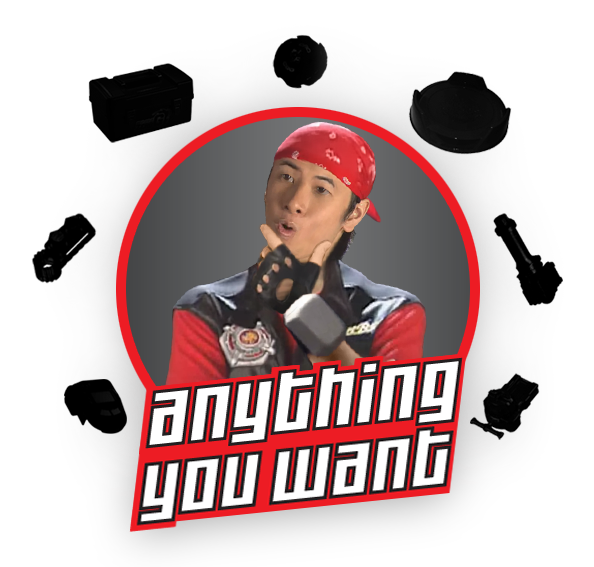 That way, there's no limit to your dedication to Beyblade! Any region that has been unable to host a tournament in the last 6 months will see the entry fee waived for its Bladers on this occasion! To further commemorate the start of the official WBO Instagram account, we're inviting you to join a fun campaign: BeySelfie! From now until June 6, post a selfie of yourself up on Instagram with something Beyblade-related to show your passion for the game. It could be one Beyblade, it could be you laying down in your sea of Beyblades, etc. It's not required to enter, but you can also tag us in your post @WorldBeyblade! 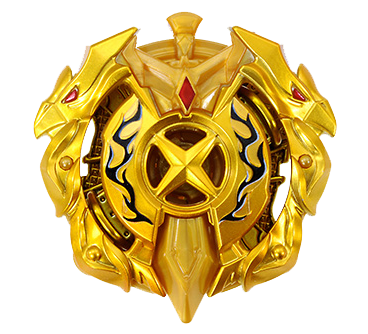 A brand new Xcalibur Force Xtreme Gold Ver.!! Good luck to all Bladers in advance! BeyLotto — Win Huge Prizes! Yet again we're closing off BeyDays with a grand BeyLotto! All participants in a BeyDays tournaments are automatically going to be entered in this crazy giveaway. Therefore, the more events you participate in, the more chances you have at winning a prize! On top of that, a participation in the aformentioned BeySelfie Campaign will grant you one entry in the BeyLotto as well! No matter where you are, you can have a shot at the prizes! As usual, Passport Holders are given the priority for the top prize, as thanks for their continued support! For the stupendous ~ANYTHING YOU WANT~, all we ask you is the usual: be reasonable in your choices (under $50 USD), explore the web to make sure it's actually obtainable, and please give us a list of three items you would like to get the most. Submit tournament footage, gain extra BeyLotto entries! On top of that, this year once again, if you film scenes at the BeyDays tournament you attend and put the footage together for the BeyChannel, you'll get an extra entry in the BeyLotto! Show us what your community's like and how intense the battles were! If you have footage please follow the guidelines outlined here and send it to Kei. If you do not have enough footage to put together for a 2-4 minute video as is described in that thread, send the raw footage to Kei through a file sharing website instead. So, what are your thoughts on BeyDays, and what are your thoughts on Beyblade? The past year has shaped a very bright future for our community and we certainly couldn't do much at all without you, so this is celebration of your Beyblade activity as well! Thank you! The end of May hasn't come yet, but Happy BeyDays in advance from the whole WBO Committee! That means that we have a huge backlog of tournaments to work through, but rest assured we’re going to get through all of them. For those of you who’ve battled in Burst tournaments already, please look forward to seeing your rank soon — I know I am, as well. Going to the Rankings section of the site will now default to Burst Rankings, but of course there is still an option to view rankings for Metal Fight Beyblade, and we’ll continue to host and process tournaments hosted in MFB formats. With the introduction of Burst rankings, we’re taking an important — and frankly, overdue! — step into the future of the WBO. But it’s not the only step we're taking. Some of you might have noticed that we’ve started using Instagram (follow us at instagram.com/worldbeyblade!). Additionally, we’re making more efforts to be active on Facebook and Twitter, and expand to other social networks where we can reach new Bladers! To spearhead that effort, we’re happy to welcome @[cadney] to the WBO Committee. She’s a relatively new Blader, but her passion for the game and the community we’ve built here, along with her years of both personal and professional experience in community management, social media, and communications make her the perfect fit for the role. Please join me in welcoming our two newest Committee members, and look forward to their contributions! Finally, after almost a year in effect, the F230CF/GCF Trial Ban in the Zero-G Format has come to an end. But, what's the final verdict? Are we waving goodbye to the troublesome duo or are we giving them a probably not-so-warm welcome back? If you played in any of the 10 events throughout the Trial Ban, you probably noticed how much fun the events were; no Blader ran the risk of being caught in F230CF/GCF's trap! While yes, they are indeed beatable, they are still — to this day — one of the most versatile setups to enter the game. With opinions from both the WBO staff and from you, the Blader community, we've come to the conclusion of keeping the F230CF and F230GCF duo banned! They will continue to be considered illegal in Zero-G Format Tournament play. Dual Layers are finally revealed! Time for... a Face Contest! To commemorate the upcoming release of a new Beyblade Burst system, Dual Layers, in April 2016, we thought it'd be fun to ask you to imagine one of the first four Beyblades before pictures of it actually get revealed! We did this for Bandid Genbull in 2012, remember? Since we've already seen what Victory Valkyrie B.V. will look like, we challenge you to imagine what Storm Spriggan's design will be! And you know what? The winner will obtain a free Storm Spriggan once it's released, woo! Of course, this wouldn't be a Face Contest if you couldn't win a Face Booster too! The deadline is March 4th 2016. The official English logo for Beyblade Burst has been revealed in the United States Patent and Trademark Office database, registered to d-rights — the official license manager of Beyblade. To see this registered now suggests that plans for the series' international release are well underway. Unfortunately, we still don't know when that release will be. While various publications (particularly surrounding the live action movie announcement) pegged it at 2017, there doesn't seem to be a strong source for this. A 2017 release would be comparable to the delay between Takara-Tomy's launch of Metal Fight Beyblade and Hasbro's release of Beyblade: Metal Fusion, but that can't necessarily be used to predict the future. And while it's easy to assume so, we still don't have confirmation that Hasbro will actually be the company to pick up the distribution rights. Still, one thing's for certain: someday, somehow, Beyblade Burst will be hitting stores worldwide. Today we're releasing our first rulebook for Beyblade Burst. It's available here and will be used for all Beyblade Burst events hosted by the WBO starting immediately. We’ve put in a lot of work towards streamlining these rules and making them easier to understand for Bladers of any skill level, in addition to helping tournaments go more smoothly. 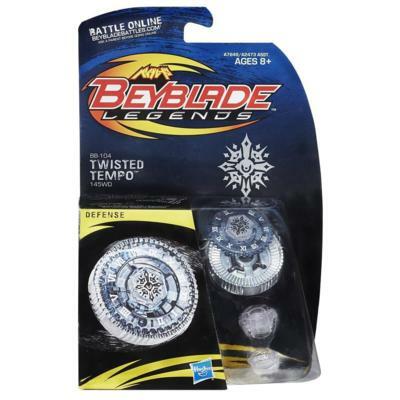 The biggest change made is the switch to mandatory double-blind selection; during the Beyblade selection phase of the match, both Bladers are to select their Beyblades in secret. The complicated stalling clause rule is no more. Another meaningful addition is the Tournament Code of Conduct, which outlines what’s expected of Bladers participating in a WBO event. One of the reasons previous rulebooks were so big is that they were constantly being updated to react to ways that Bladers were attempting to exploit the rules. By simplifying them and clearly stating that attempts at circumventing them won’t be accepted, we’re trusting Bladers and judges to use their best judgement. Other than that, the expectations are pretty basic: be nice, help new players, and keep the tournament running smoothly. Not very different from what you were already doing anyway, right? One thing I would stress is that booing or taunting other Bladers isn’t OK, even if it’s meant as a joke. There’s no way to know if the other person is actually hurt by it and just trying to laugh it off, and it makes us look pretty bad to new Bladers and outsiders. As with all rules in the WBO rulebooks, breaking them could lead to a suspension or ban from both the WBO website and tournaments — something we hate to do, but will do as necessary. So play fair and be good to your fellow Bladers! 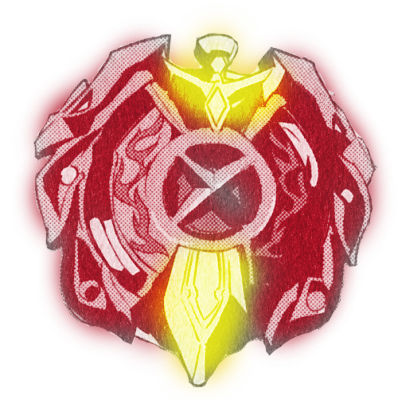 Quote: The Layer Odin is currently banned from use in World Beyblade Organization events due to its extremely high rate of victory compared to all other Layers in the game, when used in certain combinations. Due to its lack of reliable counters, the game became unhealthily centered around it. This ban will be reviewed as new products are released. We’re sincerely thankful for all of the feedback we received from the Blader community, which was invaluable in helping us reach this conclusion. There are definitely some who won’t be happy about this, but to be clear: none of us are happy to ban parts from formats that don’t normally restrict parts usage, so we’re hoping to bring Odin back into play as soon as a new release can bring balance to the game, or if some previously-undiscovered strategy comes to light. You can continue to discuss the ban in the original thread. You might’ve noticed that the new rules are on Google Docs. We’ll be using Google Docs for future documentation releases since it’s easy to update, distribute, and access from any device. Rule changes that have been made for the Burst format don’t apply to other formats, but we may update those rulebooks in the future to be more in-line with this one. And that’s it! Again, if you have thoughts on the new rules, feel free to post them in this thread. Today we have an exciting announcement to make: the opening of the Japanese Forum! As Beyblade’s birthplace, Japan has always held a massive importance. Yet, though so many of us import Beyblades from Japan and eagerly await news from Japan about new releases whenever a new series is active, the Japanese Beyblade community has always remained far removed from everything that we are trying to accomplish here on the WBO. With the advent and prevalence of things like Youtube and Twitter since the original series launched so many years ago, we’ve gained the ability to come a little bit closer. But nevertheless, we’ve still remained separated. This is something that didn’t seem right given that we are, after all, called the World Beyblade Organization. Recently, WBO member OkinawamTS informed us that he would be attending the World Hobby Fair Winter 2016 in Japan and would be happy to promote the WBO while wearing our t-shirts and handing out brand new, Japanese WBO Promo Cards. Because we didn’t want any Japanese people who visit the site to not have anywhere to go, we decided now is as good a time as ever to finally open a Japanese WBO Forum! And thanks to ClaraM, who graciously agreed to translate some essential text for us, the forum is now ready! She will also be acting as the moderator for the forum. Thank you so much for your help! Of course, the forum is for Japanese-speakers only, but please feel free to take a look at it here. Finally … not only would we like to encourage the growth of a Japanese community here on the forums, we’d also like to promote what arguably makes the WBO so special: our tournaments. And we’ve got one for you! 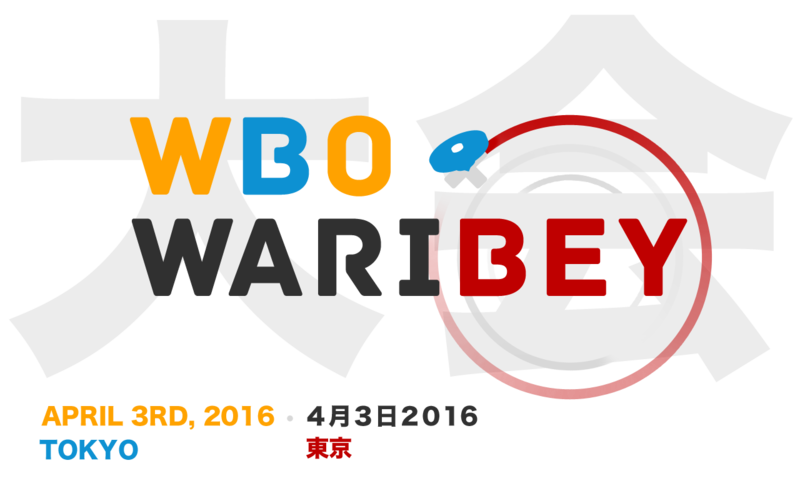 Partnering with famous Japanese Beyblading team WARIBEY, we will be hosting a WBO x WARIBEY tournament on Sunday, April 3rd in Tokyo, Japan. Please stay tuned for more details in the official thread! Scavenger Hunt 2015 - Results! After much suspense and speculation, it's time to reveal the results of the Scavenger Hunt!! First of all, the whole team would like to thank you for participating so actively. You guys clearly had a passion and it was so pleasant to see you all hard at work! We'll start by giving the answers for the questions. The success rate for this year's bunch was quite high, so good job to all, some almost free points! Also remember that the Committee was technically only introduced when Beywiki got turned into the World Beyblade Organization, even though some of the above Members have been part of the staff since almost the beginning of Beywiki. Find the fact on worldbeyblade.org: "Where does our use of 'carp' as a word filter come from?" Blader:Kenny's FIGHTING ANIMALS topic. It started with "Ginta said carp", but I am not certain it should be linked to hah. Find the fact on Beywiki! : "What are all the languages covered by Beywiki's database?" For this, we accepted two sets of answers : either just Beywiki's four languages (English, French, Turkish and Italian), since the question did say "Beywiki's database", or Beyblade Wiki's full list of languages, but English and Turkish needed to be added to the long list since technically Beywiki has already merged with Beyblade Wiki even if the articles have not all been moved yet : English, Deutsch, Español, Русский, Polski, Français, Italiano, Português, Chamoru, Ελληνικά, עברית, Bahasa Indonesia, 日本語, Nederlands, ‪Norsk (bokmål)‬, Português do Brasil, Tiếng Việt, 中文. 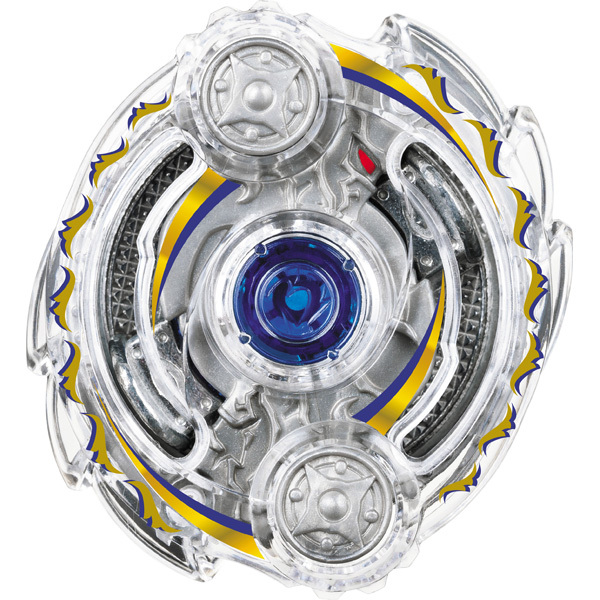 Find the fact on Beywiki: Name four Beyblades that only have up to 100 units released. There were many good answers, but the most common were : Legend Beyblade Set, Gryph Dragooon SA165WSF, Valkyrie Wing Accel Black Knight Ver., etc. Wyvern DJ Gold Ver. apparently had 400 copies, so it couldn't be accepted! Find the fact on worldbeyblade.org: Name one account that was deleted from the World Beyblade Organization. This question was kindly donated by Hato, who also humbly decided to remove himself from the contest to avoid any conflict of interest! The best answer was DormantSpirit, which we discussed more than once even years after the act, but there was also Flaming Tiger. Essentially, deleted accounts have posts with black usernames. 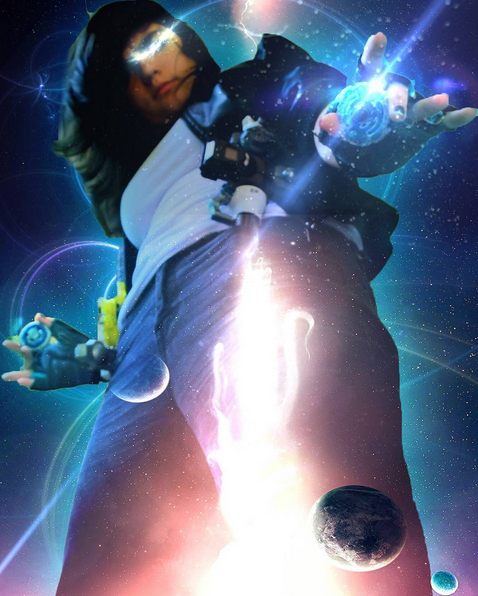 Find the fact on worldbeyblade.org: "what was the quest for?" Also donated by Hato! The answer was Quetz, from "The Quest for Quetz", our first Blader Rewards campaign! Find the fact on worldbeyblade.org: "What was the name of the Beyblade series that could have been released after Beyblade G Revolution?" Another donation from Hato! It was "Beyblade Insect". Find the fact on worldbeyblade.org: Name two other alternative links for the World Beyblade Organization. We had a few that we are actually going to get rid off, but some of them are : worldbeyblade.net, worldbeyblade.com, beywiki.com, beyblademetalfury.com, etc. Hopefully you're not biting the interior of your cheeks too much after seeing how simple some of these questions were, but it's all for fun anyway! Before moving on to the real meat of this post, here's a remainder of all the Face Boosters you can get in exchange for the points you earned, not to mention the Anniversary Face 2015 that you will automatically receive if you succeeded in reaching at least three points! Leave us some more time to distribute them though, that busy life! The fresh-off-the-stove Face Booster DRIVER for 6 Points! Great job you guys! As you'll see, some of you were super close, so this is heart-wrenching, but you're still eligible to Face Boosters, so may all the BeyLuck be with you for you to get the Faces you want the most! Now, as for the physical prizes, we do have a surprise! Thanks to generous donations, we were able to add three extra prizes! Thank Cannon for a Burst Launcher Grip and BeyLauncher and Hato for a Beyblade Legends Twisted Tempo! These guys make all the difference! With fourteen points... Maximum Dranzer! With fourteen points as well... Get Rekt! And with fifteen points... @[Neo]! With a total of twenty-four points... Wombat! With twenty-seven points... Angry Face! With thirty-six points... ashton pinto! Coincidentally with forty-two points each... Time and DRAGON KING EX! With a grand total of forty-three and forty-nine points respectively... the big winners are *Ginga* and 1234beyblade!!! Awesome job to all of you, you really deserve it! To claim a prize, send a private message to Kei. If you want to exchange your points for Face Boosters, post your choices in this thread and we'll roll out all of those Faces in waves, as soon as possible. Please give everyone a big round of applause, this has been a crazy month, but hopefully everyone finds it worthwhile! Stay tuned for more big announcements for the community later on! 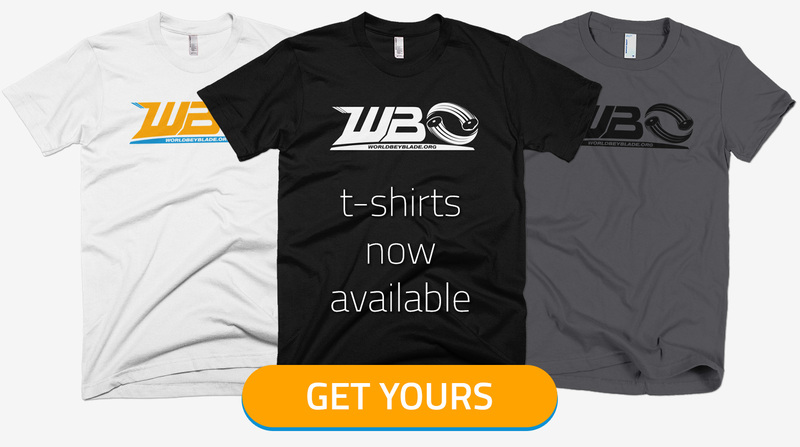 WBO t-shirts now available – support the Beyblade community in style! These aren't lame giveaway-quality t-shirts. These are the real deal. I feel good about wearing mine. Each shirt costs $25 USD. All proceeds from these sales go straight back into the World Beyblade Organization, and we use that money to keep the site up, give away awesome prizes through Blader Rewards, host special contests like the Scavenger Hunt, and build new features for the site. As thanks for your support, you'll receive the Shirt Face for your first purchase! A big thank you to anyone who decides to pick one of these up. Feel free to post your feedback and your coolest Blader style in this thread. Designed by former Committee member theflightyellz and refined by Kei, the brand new WBO logo replaces the original one designed by myself seven years ago. This is something we’ve wanted to do for a while, and this seemed like the perfect time to do it – not only is it our anniversary, but it sets the stage for all of the other projects we’re working on for 2016 and beyond … like a real site redesign. Many of you have been asking us to make WBO t-shirts available to everyone for a long time, and now we have! And these are seriously nice shirts: we’re using 100% ringspun cotton tees from Alternative Apparel and printing on them using direct-to-garment technology. I wanted to be proud of whatever shirt we finally produced for everybody. And I'm very happy to say these deliver. WBO t-shirts are available in both men’s and women’s sizes and come in white, black, and dark gray for $25 USD each. You’ll also receive the T-Shirt Face with your first purchase! As always, all proceeds from these sales will go towards funding WBO activities – and with all of the huge stuff we’re working on, your support is greatly appreciated. Speaking of support: don’t forget that our limited time donation present, face booster αlpha, is availably only until January 1st, 2016! Don’t miss your chance to get these awesome Faces commemorating the release of Beyblade Burst, and help us build the future of the Beyblade community in the process. T-shirts aren’t the only way to show off your Blader style: Angry Face has designed a special series of BeyLogger inserts to commemorate our new logo! Just print the PDF, cut them out, and insert them into your BeyLogger. The long-awaited Scavenger Hunt is back, with new quests that will test your dedication to Beyblade! For those of you who have never participated, the Scavenger Hunt will task you with performing various tasks in the Beyblade community, like hosting or competing in tournaments, making videos and posts about Beyblade, answering trivia questions, or even just sharing the love of Beyblade with your friends. In the spirit of looking towards the future, this year’s Scavenger Hunt prizes include some currently-unreleased Beyblade Burst items, like Xcalibur Force Xtreme! Scavenger Hunt participants will get the first shot at the latest Faces contained within Face Booster DRIVER! And of course, for 3 scavenger points, the Anniversary Face 2015 will be yours! Learn more and get started in the dedicated Scavenger Hunt thread. Free entry from December 12th to December 20th! To help as many regions as possible come out to play even in winter, we're giving you a freebie: the entry fee will be waived from December 12th to December 20th! You can still purchase a Blader Passport for upcoming events, but really, just have fun and get together! 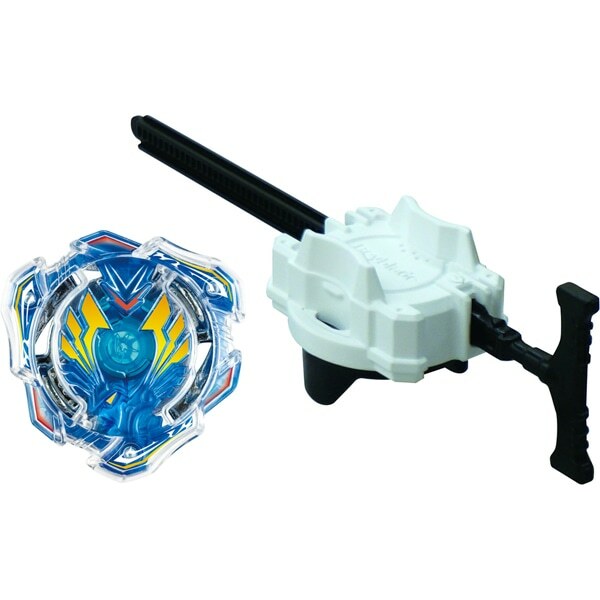 Awaken the legendary Beyblade Amaterios Aero Assault – and claim it as your own! Prove your strength as a Blader by winning the most consecutive battles in a WBO Burst-format tournament to win an exclusive Face, the Shard of Amaterios. 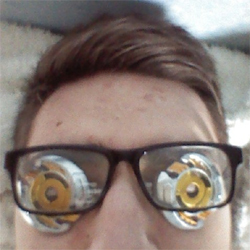 Collect 3 Shards of Amaterios to summon the legendary Beyblade straight to your doorstep. The Awakening Amaterios campaign is valid for all WBO Burst-format tournaments starting January 1, 2016. We’ll reveal the Shard of Amaterios around that time. Awakening Amaterios tournaments are limited to 1 per month per region, and there are multiple Amaterios available to win. A big thank you to Hato for generously donating one of his Amaterios to us, and helping us get this campaign started. 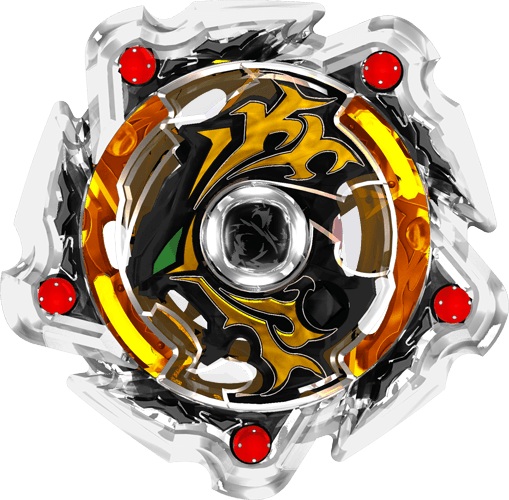 Amaterios isn’t the only Burst Beyblade making its way into the WBO prize roster: various Beyblade Burst items are now available under the Blader Rewards program! Unlike previous updates, we won’t be resetting Credits this time, so if you’ve been saving up for a while, now would be a good time to go shopping. Find out more about Awakening Amaterios and the new Blader Rewards in the dedicated thread. ~Thunder~! Congrats! Claim your prize by contacting Kai-V and we will make sure you receive it as soon as possible. And thanks again to Stars for the generous donation! As we enter the eighth year of the World Beyblade Organization’s existence, the future looks somehow more promising than ever. Certainly, the fact that there is finally another active Beyblade series helps, as does the promise of its nearly-inevitable international release. But what’s most encouraging is the immense strength of this community after seven years of ups-and-downs. We’re in a better position than we’ve ever been to do some amazing things, so be sure to stick around. There's no breaking traditions: the Scavenger Hunt 2015 is on! To those who are new to the concept, all you need to do is to achieve one of the goals or find one of the answers in the list below to gain points. Those points rank you up against other Members, and the top scorers will win physical prizes. But no worries: almost everyone ends up with Face Boosters as well! Once you think you've found a correct answer or if you've done one of the achievements, simply send a private message to Kai-V with the proof of it. To start off, while we gauge how busy this year's Scavenger Hunt will keep us, we will not straight away let you know if the answer to a question is good. Therefore, be sure to take your time and research your answer to verify that it's correct before sending it, but you can't share answers with others! A scoreboard will be posted at least once midway into the Scavenger Hunt period, to let you know if you need to work more to get higher. You have until January 4th 2016 11:59:59 PM EST to send your proofs of your achievements and your answers. That means that anything sent afterwards, even if it was technically achieved before January 4th, will unfortunately not count. Without further ado, here's what you can get out of this Scavenger Hunt! Here are all the prizes you can win if you reach the top of the scoreboard! Actually, who knows what Santa Claus has up its sleeves; maybe some other prizes are stuck in there! Stay tuned! As you can see, the exclusive Face Booster VIVID is back on this special occasion, and you can get one if you can gather at least 8 points in this Scavenger Hunt! Additionally, once you've gathered 3 points at least, you will automatically receive the marvelous Anniversary Face 2015!! These Face Boosters will cost 6 points each. The brand new Face Booster DRIVER will also be available for 6 Credits! And even those who reach the top 10 and win physical prizes can exchange their points for Face Boosters! Like for the prizes, we'll try to add more challenges and questions along the way. It'll be super easy to get more points, you'll see! We'll hide the first Face shortly, be on the lookout for updates in this thread! The rules are set, the prizes are at the end of the road; now it's up to you guys! May the best Blader Spirit win! Good luck to all of you! On time for the WBO Anniversary 2015, we're presenting the 5th wave of Blader Rewards, as well as a new campaign! Credits are added manually by staff members whenever the tournament you participated in gets processed, so just hang tight if you don't see them in your profile yet! And these are all the Blader Rewards, but we might add a few later on! Once you have reached the number of Credits that make you eligible for the prize you are aiming for, simply send one of the Committee Members a private message with your full name, address, and phone number as soon as possible to reserve your Blader Reward. We will ship it to you shortly after that. You really have to wait until your Credits are added in your profile though, you can't calculate based on upcoming, unprocessed tournament results! And remember: for the 5th wave of Blader Rewards, there's no issue of resetting Credits, so go all out and good luck to everyone on this crazy race! The Odin Layer has become a staple in the current Burst metagame, and it just so happens that your fellow community member Stars generously donated a B-17 Booster Odin Central Blow just for you guys! If you're a Passport Holder, please post once in this thread to be entered in the November 2015 giveaway for a chance to win this really cool Beyblade! Bladers who post in this thread and do not possess a Blader Passport will have their posts immediately deleted. To make things even better, we will also throw in one Face Booster for the winner! This contest will run for seven days until November 23rd, 11:59:59PM EST. Any Passport Holders who post after that date/time will not be entered. The winners will be announced shortly after the date has passed and will have their prize shipped to them free of charge! Beywiki merges with Beyblade Wiki! We at the WBO are proud to announce the next step in our mission of spreading awareness of Beyblade and giving Bladers the information they need to reach their maximum potential: Beyblade Wiki is now the official wiki platform of the WBO, and we will be merging all Beywiki articles and assets into it. We believe it’s a great move for us as an organization, and will prove enormously beneficial to the Beyblade community at large. Beyblade Wiki’s increased reach will ensure that the amazing research conducted here at the WBO will reach a much larger community of Bladers. And with our host migration having left our own Beywiki in a pretty poor state, there’s never been a better time to move on to greener pastures. This isn’t just the perfect time for us, either; Beyblade Wiki has been recently undergoing major positive changes at the hands of ~Mana~, who was thrilled at the opportunity to work together on creating the best Beyblade encyclopedia possible. None of this would be happening without his generosity and co-operation, so please show him your full appreciation! From simple fixes to all-new pages, we have an unsurprisingly long list of work to do — but we’re optimistic we can get it done in record time, thanks to some updating editing procedures and more flexible approval processes. But we’re still going to need a ton of help, so we’re building a dedicated Wiki Team to help us not only move our existing content to Beyblade Wiki, but also regularly write, review, and approve article drafts before they go live. 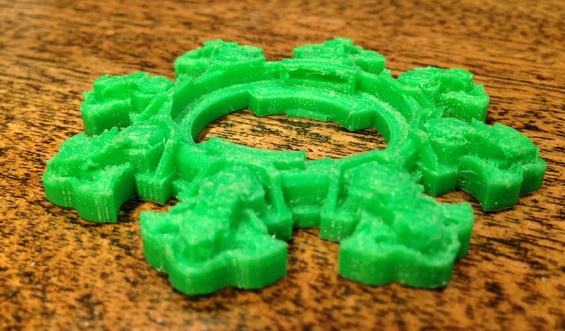 Help us build the best Beyblade encyclopedia we can. Send me a private message if you’re interested in joining the Wiki Team! In case it wasn't clear, it's really Beywiki merging into the Beyblade Wiki, so it'll be hosted entirely over at Wikia. Anybody can write and publish articles, as per Wikia's values. This means that it is no longer strictly necessary to post drafts in the Beyblade Wiki forum before publishing them to the Wiki. However, frequent contributors are still expected to discuss their findings in that forum before publishing their articles. Additionally, as we will be aggressively editing and moderating edits for new releases and popular articles, you might end up wasting a ton of time if you try to do it alone. Articles that are still being heavily researched by the community — like upcoming or new releases — will come with a note saying that all findings are provisional. Once an article on the Wiki feels what we reach is a "complete" state, we will lock it to prevent abuse. We will unlock articles if new information comes to light. While this list focuses on hobby-related articles, we’ll still be developing the anime and manga-related sections of Beyblade Wiki, so feel free to contribute there too! 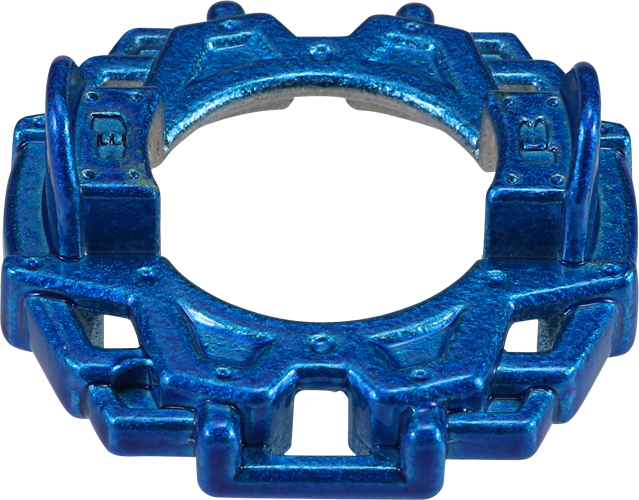 Over time, two different Beyblade articles with a shared part could end up having completely different descriptions for those parts. We've been looking for ways to fix all of those issues for a while, and cornerstone contributor Nocto has presented us with the perfect method to use: part-specific articles! Instead of writing articles about entire Beyblades, we’re changing our approach to reflect the way the game is actually played and researched: part-by-part. Maybe you’re not comfortable writing an entire article about Death Quetzalcoatl 125RDF. But maybe you can explain how Death works, and in what types of customizations it’s useful. Parts will be stored as their own articles, and larger Beyblade articles will automatically pull in the content for each part from those articles. This way, not only does each part and each Beyblade gets its own article, but if information on a part changes, it can be updated across every Beyblade article at once. Sure, if you think about it, this merge might seem really complex and perhaps even 'impossible', but it's far from that! In fact, we've started making a list of articles Beywiki has and separating them into different categories to make it easier to know what to do with them. So, let's start with establishing that first, and then just doing the work, instead of scrambling everywhere. All Italian, Turkish and French versions should be transfered as-is on the Beyblade Wikia! That's only the list of articles starting with B that we had on Beywiki. So, do you still think it's a mountain of work? Surely not! We will post the other letter lists soon, but you can also help by just choosing a letter and comparing the versions of common articles and post the lists you make in the Beywiki Project forum! And of course, we'll also need help to actually make the changes after the articles have been categorized! All significant contributors will be rewarded with the Peridot Face ! That's how you know someone's really gone out of their way to help the community! Infinite thanks in advance to all people who will help in one way or another! This is a huge opportunity in so many ways, and it's time to take Beywiki to another level, all together! If you've got any questions, don't hesitate to post them right here, we'll be happy to answer! Without further ado, we'll pass the mic to the guy without whom this would all be impossible: ~Mana~!! face booster αlpha is no longer available. A big thank you to everyone who donated! If you want to support the WBO, check out our t-shirts! We're super excited to introduce face booster αlpha, a beautiful Face Booster series designed by Kei and Kai-V in a style that brings the best of Burst to the WBO's Face Collection. The WBO's continued existence can be owed to the fact that the Beyblade community is an exceptionally generous one. Donations from Bladers who love what we do have been fundamental to reaching milestones like the BeyPoint System, Blader Rewards, and BeyDays — not to mention day-to-day workings of hosting and managing the site. The launch of Beyblade Burst does more than just give us the chance to grow the community again and continue running events; it gives us the chance to do more incredible stuff for all of you. To create a better online community. To give everyone the resources to become a better player. To give you the best events — or to help you run the best events. But at the moment when we most need to move quickly and excellently, we're ailed by extremely limited funds and an aging platform that is in dire need of some developer love-and-care. So, straight-up: we need more money than we have to deliver all the great stuff we're working on. We'd like to ask you to help us if you can. As thanks for your donation, you'll receive the latest-and-obviously-greatest in the lineage of donation Faces, face booster αlpha. Beyblade Burst's style was much more difficult to adapt to the Face Collection than any Beyblade series before, but Kai-V did an excellent job with the line-art, and Kei masterfully compressed the complex designs down to a beautiful (and high-DPI!) series of wearable art ... for your profile. face booster αlpha was available until January 1, 2016. It is no longer available. Libra has, and always will be a threat to the metagame due to its ability to perform well not only as one of the–if not the–best Defense Wheels, but as a Stamina Wheel with a slight offensive upside. As a legal part up until v1.4 of the Limited Format banlist, it has proven itself through competition to be too strong to allow its continued use. While it was legal, it appeared in close to 20% of all Winning Combinations. Its versatility is why it has been placed on the banlist. Omega was given a chance after the initial Limited Format ban list, but after having some time to take a look at it in practice, it has been decided that its weight and raw Attack power is slightly too high when compared to the rest of the metagame. Its re-banning with v1.4 along with Libra will hopefully allow for more Wheels to be viable for Attack. and the MFB: Limited Discussion forum. Additionally, in case you missed the announcement yesterday, we have increased the price of the Blader Passport to $15 USD. See the full details here. We're raising the price of the Blader Passport to $15 USD. The original $10 price was established over six years ago. To put things into perspective, back then you could have ranked battles at home without the supervision of an event judge, which was abused about as much as you might expect. Since then, the WBO has grown exponentially and so have the local communities we’ve helped foster. We all see a very promising future in sight for the WBO and Beyblade — particularly considering the launch of Beyblade Burst — and this small increase will help prevent us from losing more money than we can bear to on our events. Those of you who have active Blader Passports you purchased at $10 will of course be allowed to use them until they expire. If you have an auto-renewing subscription with us through PayPal, you’ll be receiving an email alerting you of the price change. If you don't have a Blader Passport, you can subscribe to one here, or at any WBO event. Finally, we’ll continue to sell Blader Passports for $10 at our Beyblade Bursts Onto the Scene events, because these events carry a higher entry fee and we really want to keep the barrier to entry for new community members reasonably low. Thanks for helping us build a better WBO! Big Community Announcements + HMS Face Contest Winners! Let’s jump straight into it! The WBO team keeps growing! I’m happy to announce that @[LMAO] is now a member of the WBO Committee. LMAO has already proven himself to be a prolific community organizer, and his commitment to the WBO is self-evident. He’ll be helping us develop our future plans, with a focus on making WBO Organized Play a better experience for all World Bladers. This is particularly important as Beyblade Burst continues to bring more players — both newbies and veterans — into the WBO community. And to help us find those new players, @[Mitsu] will be taking over our social media accounts going forward, in addition to becoming a Global Moderator here on the website. His charisma, eloquence and extreme level of community dedication made him the clear pick for this role, and I look forward to seeing how awesome we’ll look on Facebook, Twitter, and new social platforms going forward. For those of you thinking that the Committee seems awfully Toronto and Canada-centric: we agree. Please look forward to future announcements. While @[Kei] announced updated rules for Beyblade Burst a few weeks ago, we’ve gone ahead and added them to the Universal Rules booklet! Burst Format will get its own dedicated rulebook soon. In the meantime, please use the Universal Rules booklet at Burst Format events. A big thank you to everyone who submitted their HMS designs for this month’s Face Contest! HMS has a soft spot in the hearts of everyone who played Beyblade during the first generation, so it was amazing to see how many people who picked up playing during Metal Fight were able to capture the spirit of the system. When I initially created the Advanced Forum on Off the Chain — an idea that was inevitably carried forward to the WBO — it was due to the fact that the community was so overrun by newbies that high-level players were struggling to have any kind of meaningful conversation with each other. The world of Beyblade has changed a lot since then. The average level of player knowledge is much higher, and the community is currently at a point where things are a bit quiet. We look at Beyblade General and the Customizations section and see the best-quality content that the Beyblade world has ever seen. But we still think there’s value in recognizing Bladers who contribute significantly to competitive research and wield an immense amount of Beyblade knowledge. So moving forward, there will be no Advanced Bladers. There will only be Mentors. We hope this makes it clear what our expectations from Mentors in the community are: to be a force for education within the community, and to assist new players in mastering everything from the basics of type-countering to the most advanced shooting techniques and gameplay concepts. We’ve also renamed the Advanced Forum to Mentor’s Circle. We believe keeping this forum is important, because it allows us as an organization to do metagame research that a completely open forum would disrupt. That said, we also think there’s a ton of great content in there that maybe isn’t being seen by everyone — check it out if you haven’t, but we’ll look into finding ways of shining a light on the great learnings in the Mentor’s Circle. Some of you will be receiving Mentor invitations soon — and yes, you’ll still get your Amethyst Face. ZANKYE 100K looks like it's going to be one of our most epic events ever, and it's all thanks to the generosity of @[originalzankye], who's bringing a ton of Bey and, at least as importantly, pizza! With Zankye set to reach 100,000 subscribers on Youtube, along with the revival of Beyblade and all the awesome stuff happening at the WBO, I think we all have a lot to celebrate about. I'll be there, as will Kei, LMAO, and Mitsu, and the world-class Toronto Beyblade community! Make sure you are, too! That’s it for August! What a crazy month. Hope you all appreciated the update, and feel free to let us know what you think — and any ideas or suggestions you might have relating to these announcements — in the comments! P.S. You might have noticed some downtime earlier. Sorry about that — just some routine web maintenance! We'll go down again for a bit later tonight, but know that everything's going to be fine. We'll get through this, together. WBO x Zankye Collaboration: 100K Zankye Subscribers Event, Giveaway, and Celebration! In just four short years, Zankye has become one of Youtube's most popular channels for Beyblade. His dedication to producing new content, travelling across the globe to meet fellow Bladers, giving away hundreds of Beyblades to his fans, and affiliating with the WBO has helped to earn him a loyal following that will soon be reaching over 100,000 subscribers around the world! Check the official thread for more details and let us know if you can attend! Can't make it to Toronto? Join the online giveaway! Since we know not everyone around the world is fortunate enough to be able to make to Toronto for the tournament, we will be conducting an online giveaway that is exclusive to WBO Blader Passport Holders and subscribers to Zankye's channel! 1. Be a WBO Blader Passport Holder. If you are not a Blader Passport Holder, you are still eligible to enter, but you cannot win a physical prize. 2. Be a subscriber of Zankye's channel on Youtube. 3. Post once in this thread with a link to which Zankye video you've enjoyed the most and why. Include your Youtube username in the post OR post a link in a comment on this video with what your favourite WBO thread is, and why. Include your WBO username in the comment. Multiple comments or posts will not garner multiple entries. One Winner Announced Each Week! Starting September 6th, one physical prize winner will be announced each week, so be sure to check back on this thread and Zankye's channel often! On the final week, all of the Face Booster winners will also be announced. If you have won once, you will be taken out of the draw for the remainder of the giveaway period. If you win please contact Zankye via Youtube, or on his WBO Account, originalzankye with your full name and address to claim your prize. This giveaway will run until October 10th, 2015, 11:59:59PM EST. Any Passport Holders/Zankye Subscribers who post or comment after that date/time will not be entered. How exciting is this, everyone?! An incredible event, giveaway, and milestone for Zankye! Let's celebrate! Rather than writing a big dramatic post like I considered doing, let’s keep it short and sweet: I’m thrilled to announce that I am returning to the WBO Committee. Beyblade and the World Beyblade Organization have been on my mind for a while now, and I promised to myself that once Beyblade came back I’d give the new series a try. 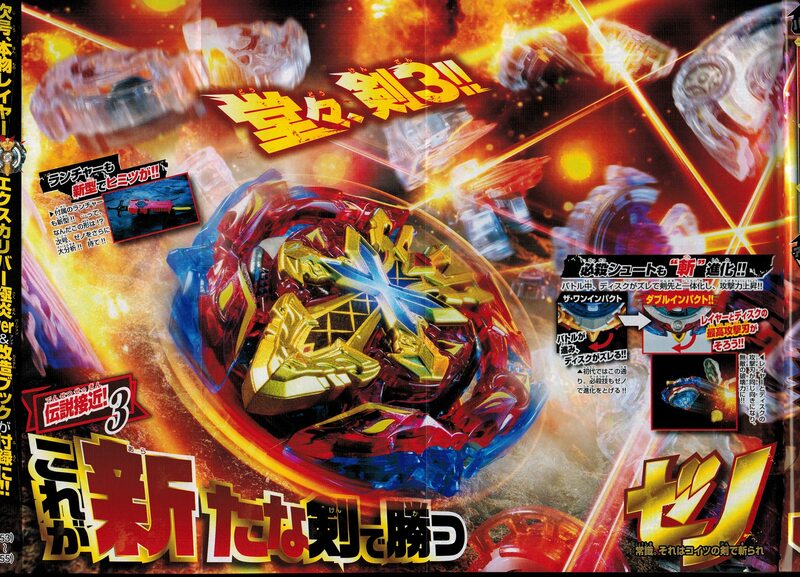 And despite my initial, cynical reaction — in which I referred to the new burst gimmick as “the death knell for Beyblade” — I’ve grown to really love it already and am excited to see where it leads. But more importantly than that, I’m excited to see how this community can evolve with the engine of an active Beyblade series driving it. I’m excited to see how we can do more for you guys and both help you and help ourselves run better events. And most of all, I’m excited to see how we can bring in new players to both grow attendance and existing communities and hopefully create new communities of Bladers, too. That’s why one of my key areas of focus will be on producing content aimed at beginners, along with introducing the advanced concepts pioneered here on the WBO to a wider audience. As a major part of that, I’ll be taking over our YouTube channel to produce Burst-related content, so please look forward to product reviews and other cool videos later this year. To close on a more personal note: it is impossible to overstate the impact nor the importance of Beyblade and its player community on my life. It has literally made me who I am. That sounds hilarious — and it is — but I also cannot overstate how true it is. So to be able to return to building the community I began over a decade ago, as a better person, is an overwhelming joy and honour. I’ll do my best for you all. Hey World Bladers! With the successful conclusion of the WBO's first Burst Format event last weekend in Toronto, we have taken what was learned from that event and decided to make official a few significant rules changes while also clarifying some other issues experienced at the event that we believe others will experience in the near future. This rule change currently only applies to Burst Format. Instead of two reshoots per tournament (and one per BeyBattle), we have changed the rule to unlimited reshoots per tournament and two per BeyBattle for Burst Format. Problems with skipping and jamming on both the BeyLauncher and Light Launcher have been found to occur much more often in Beyblade Burst than previous generations so far. We want to ensure that the outcome of every BeyBattle is as close to being an accurate depiction of player skill as possible; technical issues are something a player has no control over, and we don't want BeyBattles to be won and lost because of them. That said, just because you will now be afforded an unlimited amount of reshoots per tournament, and two per BeyBattle does not mean that you can or should abuse this privilege. Even more so than in the past, judges will be looking for obvious technical malfunctions (or outside interference from someone walking by) when deciding whether to grant the reshoot or not. This means they will be listening for things such as grinding or skipping sounds, or watching to see if the Beyblade even leaves the shooter. If you launch weakly by accident and the judge is unable to discern any obvious technical malfunction, they reserve the right to refuse your request for a reshoot. Same goes for if you miss the stadium by accident; it is entirely possible for that to be due to a technical malfunction, but it is also possible that you simply missed the stadium. All other procedures related to Reshoot Clause regarding the switching of parts or launcher after invoking it remain the same as they are currently described in the Universal Rulebook. If a judge determines that you are attempting to abuse Reshoot Clause by calling it too frequently without making any change in your equipment, they have the discretionary power to take it away from you for the duration of the BeyBattle. When a seemingly simultaneous Burst Finish on one Beyblade and Knockout/Outspin on another occurs, judges should give priority to the Beyblade that remained intact when deciding the outcome of the round. The reasoning behind this is because logically, if the opposing Beyblade bursts, the one that didn't was either still inside the stadium or still spinning at that specific moment. For a Beyblade to Burst, it must be hit by a Beyblade inside the stadium. If one Beyblade is launched out of the stadium or stopped spinning a split second later, that doesn't matter; it was in the stadium or was still spinning when the opposing Beyblade burst, so it should be given the win for that round. The only exception is if a Beyblade bursts not because of the direct hit from it's opponent, but from the impact of hitting a wall as a result of that hit. In that case if the intact Beyblade exits the stadium before the opponent bursts as a result of hitting the wall, the Beyblade which exited first would obviously be the loser. In cases like these, what this means is that judges, you must pay very close attention to what is happening in the battle at all times. 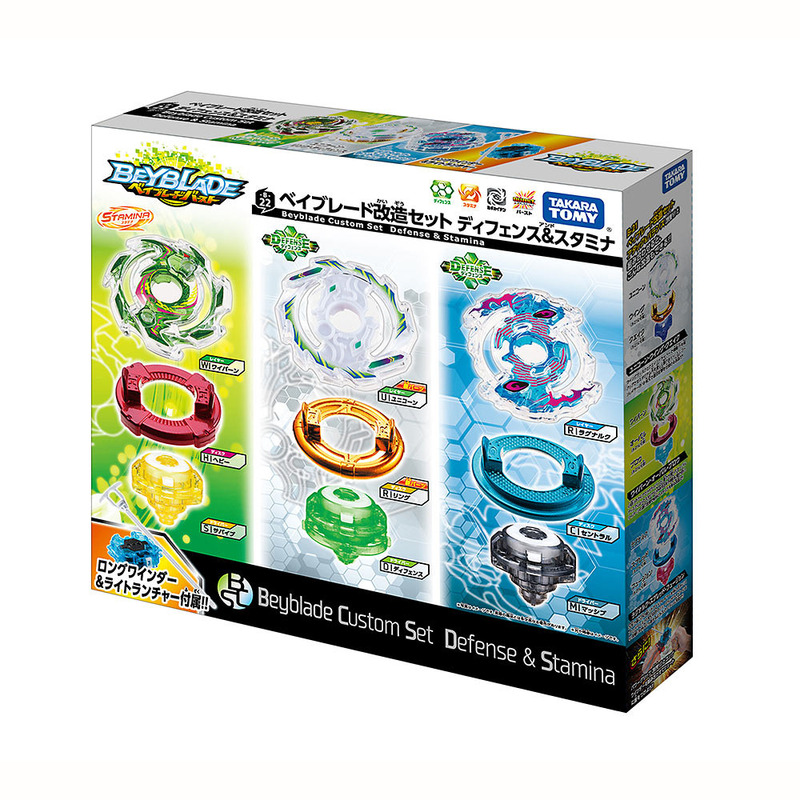 Beyblades in Burst Format cannot be launched on top of the barrier that surrounds the Beystadium. Beyblades must therefore be launched inside the barrier. It is OK if the Beyblade hits the inside edge/rim of the barrier and then falls into the main play area below, but it cannot spin on top of the barrier and then fall in. Beyblades launched outside the barrier will be given a round loss for that BeyBattle. 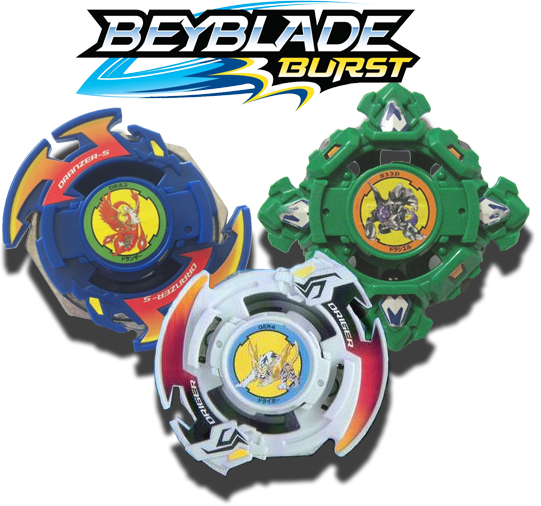 In Burst Format when a BeyBattle between two Beyblades using the same or similar parts occurs, it can become difficult to discern which Beyblade is which when a Double Burst Finish occurs. The production lot/batch number on the bottom of the Layer. Usually this will be something like "A1", "A2", "A3", etc. 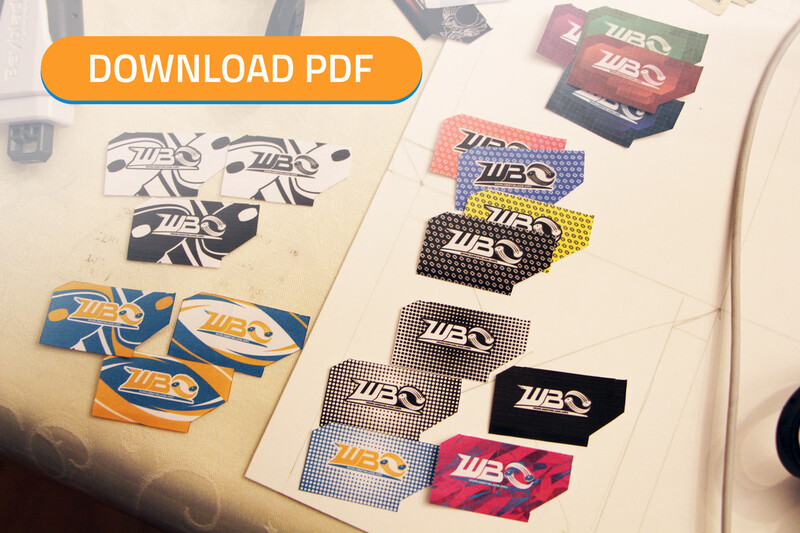 Place a few of the star stickers included on every Beyblade Burst sticker sheet on your Driver, Disk, and Layer so that you can identify which part is yours. Stickers cannot be placed on the perimeter of the Layer, Disk, or bottom of the Driver. For Disks, stickers must be placed on the bottom. The first Burst Format event in every region will be unranked. We hope that this will allow everyone to take the time to learn the new format, gain experience, and experiment without feeling the pressure of having to worry about your BeyPoint System ranking! It is still to be determined if we will integrate Burst Format events into the current BeyPoint System, or if we will wait until we are able to have separate rankings for each format, but for the second event and beyond in each region, the results will absolutely be processed at some point in the (hopefully near) future. 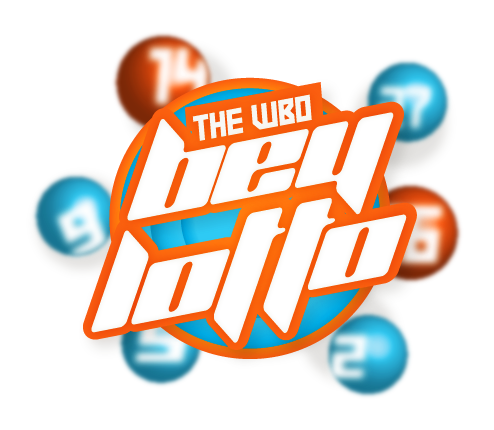 Organizers, despite the first events not being eligible for BeyPoints, they must still be submitted using the WBO Organized Play Results Spreadsheet. Everyone, if you have any questions, comments, or suggestions please feel free to ask them here. Beyblade Burst is still in its infancy, so the changes and recommendations found here are subject to change as we all gain more experience with this format! World Bladers rejoice! As most of you already know, as of July 18th, the third generation of Beyblade–Beyblade Burst (ベイブレードバースト)–has officially been launched in Japan! In celebration of this momentous occasion, the World Beyblade Organization has taken the time to put together a full review of the series on our official Youtube channel: BeyChannel. Please take a look at the video above! Spread the word! Share with your friends! Help us get the word out about this new series by sharing this video with all of your friends and liking it too. Let's show everyone what makes this exciting new series unique and why they should jump back in to the game, or try it for the first time! A big thanks to Bey Brad for his input in the production of this video, and not only a great script, but the voiceover as well! And thank you as well to Kai-V as well for her input throughout the process. 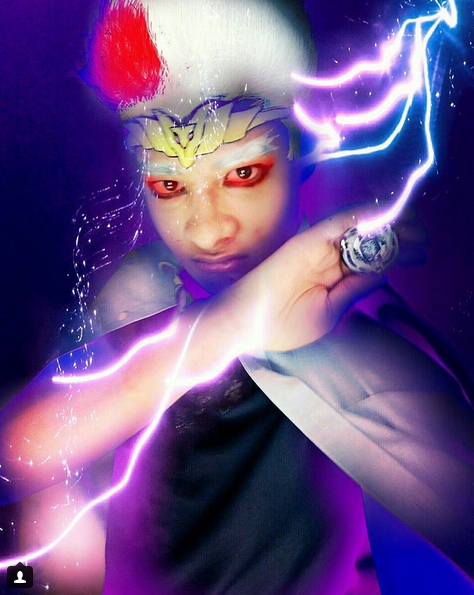 BeyDays 2015 BeyLotto & Face Contest: Design a Beyblade Burst Beyblade results! New WBO Authorized Beyblade Dealer: Mr. taka.ohno! !